Food on a stick is just more fun. Popsicles, sandwiches … pretty much anything-kabobbed is automatically a fun-ness upgrade. And ya know what else is fun? Summer! Picnics and BBQs, and looooong lazy days with friends and family. Ahhhhhh … summer! So these fruit kabobs are pretty much Fun x 2. Maybe even Fun²! 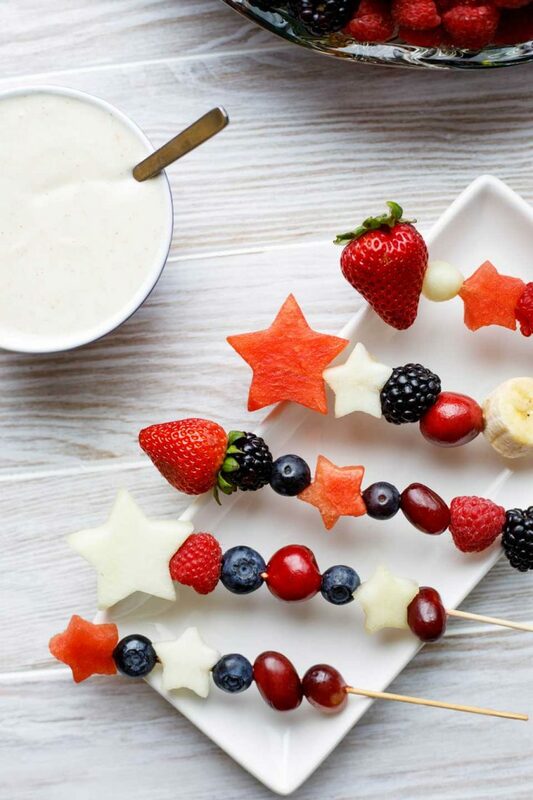 All decked out in red, white and blue, these fruit kabobs will be your go-to picnic recipe from Memorial Day (that official summer kick-off!) straight on through to Labor Day (when we all sadly acknowledge that summer has to make way for autumn). 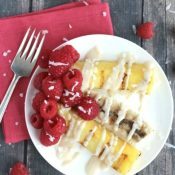 Or as a decadent (but still healthier, bikini-friendly) dessert! Fruit kabobs are a sure hit as appetizers and snacks, and they’ll be big-time attention-getters on long buffet tables filled with potluck snackies and side dishes. 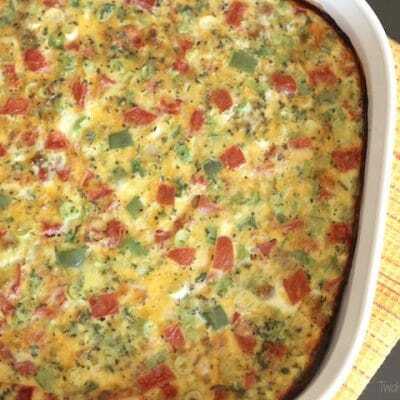 Just serve them alongside some yummy fruit dip, and stand back as the masses swarm in to grab ’em up! No doubt, my favorite appetizer fruit dip is our Healthy Sugared-Vanilla Yogurt Fruit Dip. 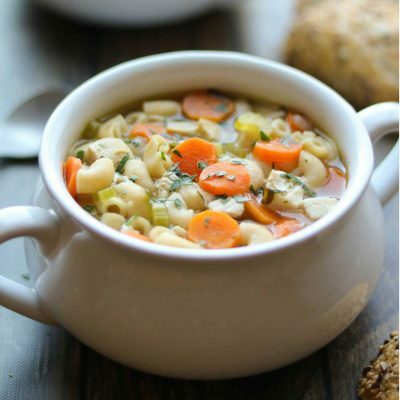 With just 4 simple ingredients it’s so easy … like, 5 minutes easy … and also surprisingly healthy. It’s creamy and cool – perfect in the summer heat – and the notes of vanilla, brown sugar and cinnamon are terrific complements to summer’s fresh fruits. 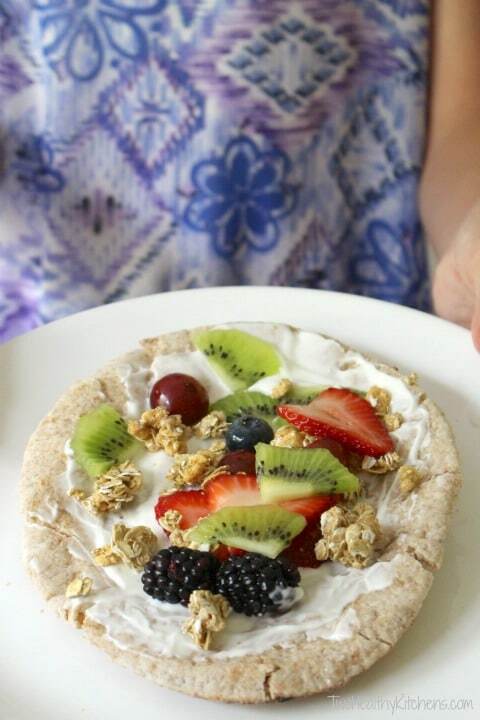 2) A Healthy Dessert – Refreshing and Bikini-Friendly! Wanna spin these fruit skewers in a sweeter direction? A dessert direction? Maybe with some cake and chocolate? It’s so easy! Just swap out some of the white fruits in your red-white-and-blue color palette, using fat-free angel food cake instead. And then … whip up some Chocolate Lava Dip for dunking! 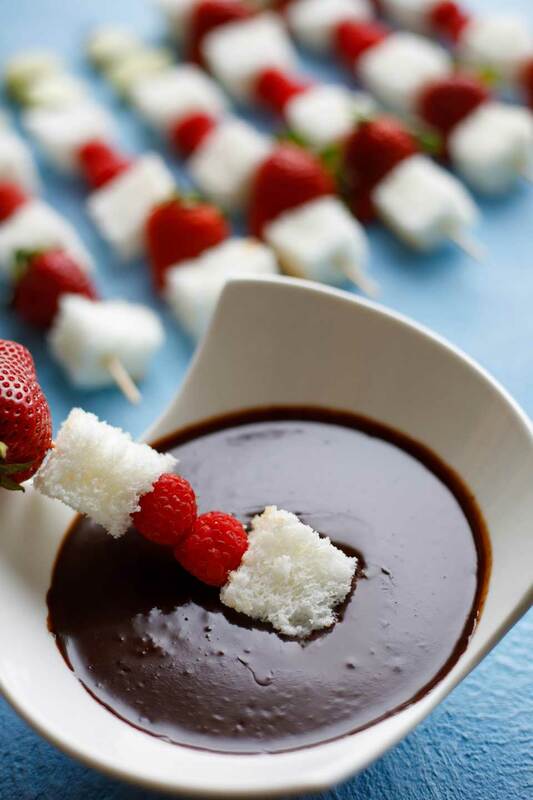 Nestled next to pretty fruit kabobs, it’s like a picnic version of fondue – serious fun-ness factor going on here! And the guilt that usually comes along with decadent desserts? 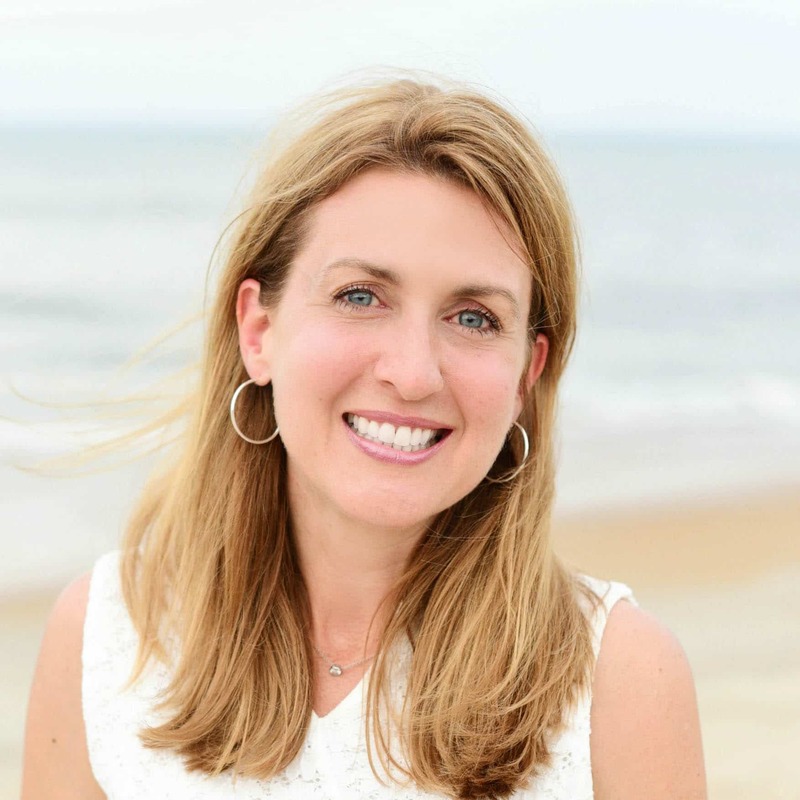 The worry about whether that dessert you’re craving can possibly play nicely with the swimsuit you’re wearing? 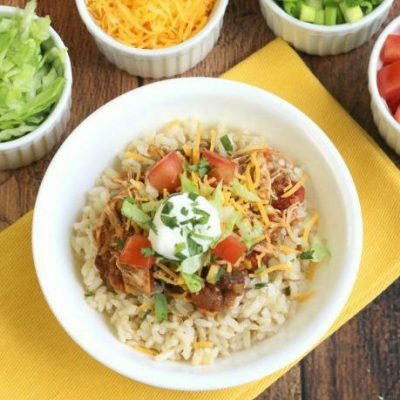 Healthier decadence in moments – perfect! 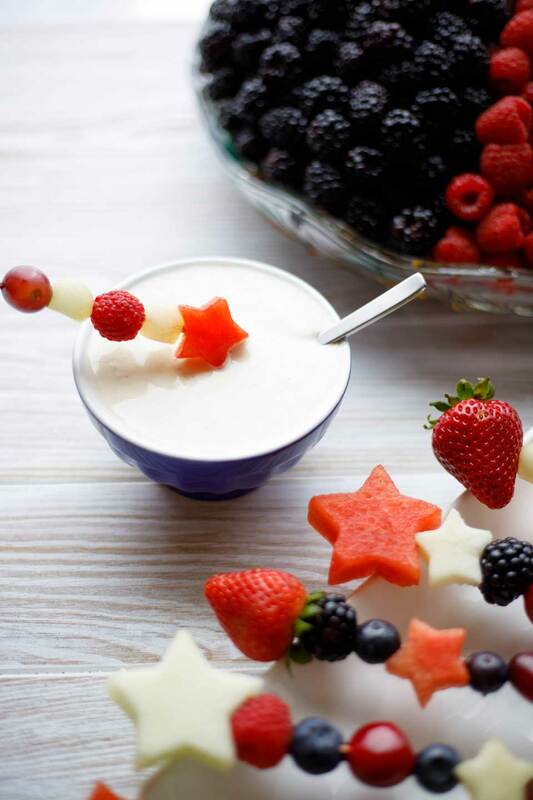 These patriotic fruit skewers are just a riff on the Fruit Kabobs and Fruit Bouquets we taught you how to make almost five years ago (where does the time go?!?). 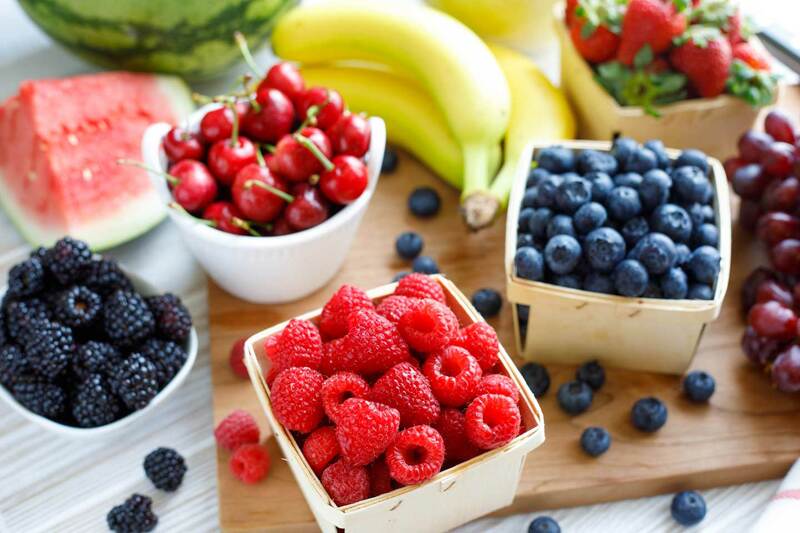 Gather red, white and blue fruits. 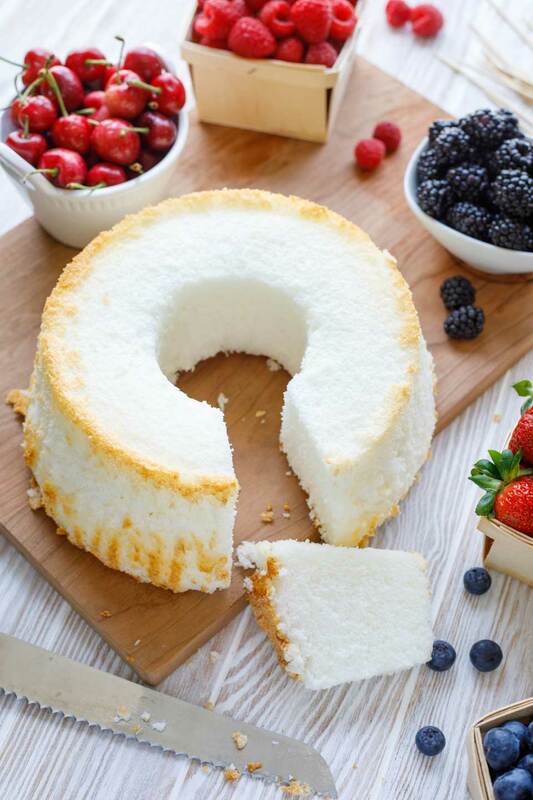 If you’re making the dessert version, grab an angel food cake, too (to save the time of making it yourself, you can purchase one at most grocery store bakeries). Wash, peel and cut your fruit into kabob-sized chunks. For dessert skewers, cut your angel food cake into chunks, too. 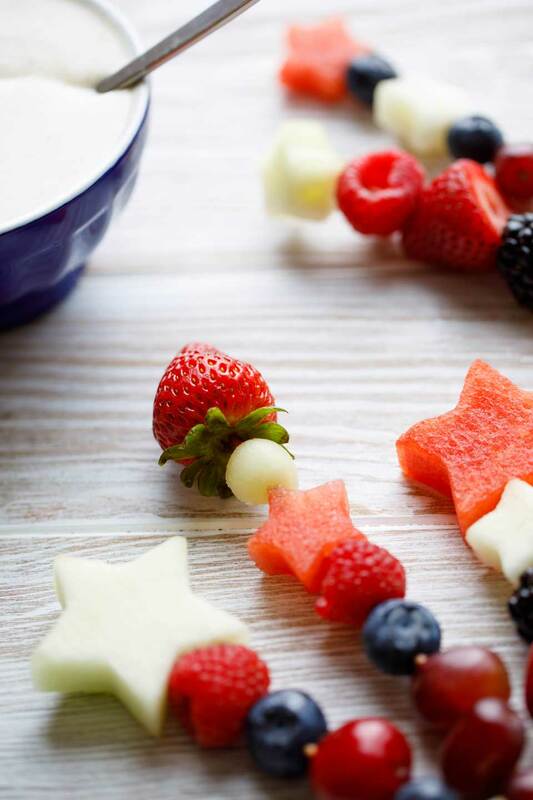 Use cookie cutters to make patriotic stars out of melons if you’d like to really jazz up your kabobs (cute but totally optional). 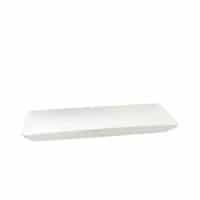 We generally recommend that you cut the melon into slabs about ½” thick. 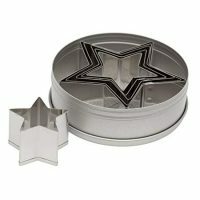 Specifically, you always just want the melon slices to by slightly thinner than the depth of your cookie cutters (so your cutters will easily be able to cut all the way through). Thread your ingredients onto bamboo skewers, alternating colors and fruits. Serve your fruit kabobs next to our Yogurt Fruit Dip for an appetizer, or Chocolate Lava Dip for dessert. Bask in the praise of happy friends as they scarf down your adorable picnic food that’s waaaaay more fun than regular fruit (since, as we’ve already covered, food on a stick is always more fun)! For a really stunning presentation, you can dial the fun-ness allllllll the way up by creating a fruit bouquet with some of your fruit skewers. 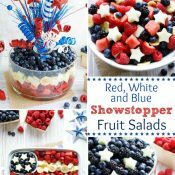 Perfect way to add HUGE impact to a fruit tray or star-spangled summer fruit salad! 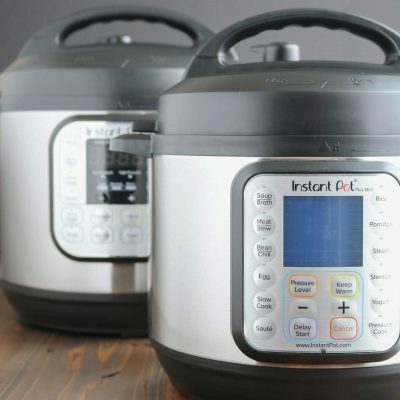 And, seriously – it’s so easy! • If you want to arrange your skewers at the center of a fruit tray as we did in the photo above, start by placing a small vase or drinking glass in the center of your tray BEFORE piling all the other fruit around it. • It’s generally best to choose a firm, dense fruit (like a grape) to be the very bottom fruit on your skewer, so it can successfully support the other fruits above it without sliding down the skewer. Over time, less dense fruits (like watermelon cubes) tend to begin migrating south, sliding down along the skewers. • Snap some of your skewers a bit shorter than others, so your fruit bouquet has skewers of varying heights. • If you’re creating a dessert fruit bouquet that includes chunks of angel food cake, make sure the cake chunks are near the top of the skewers in your bouquet, since they can’t support much weight and will get squished if you thread too many other pieces of fruit on top of them. Alternately, you can offer a big bowl of angel food cake chunks off to the side, with toothpicks for individual skewering. This is a cute little twist, perfect for summer holidays like the 4th of July … and, maybe most especially for Flag Day (because everyone throws a big Flag Day Party, right?!?!). 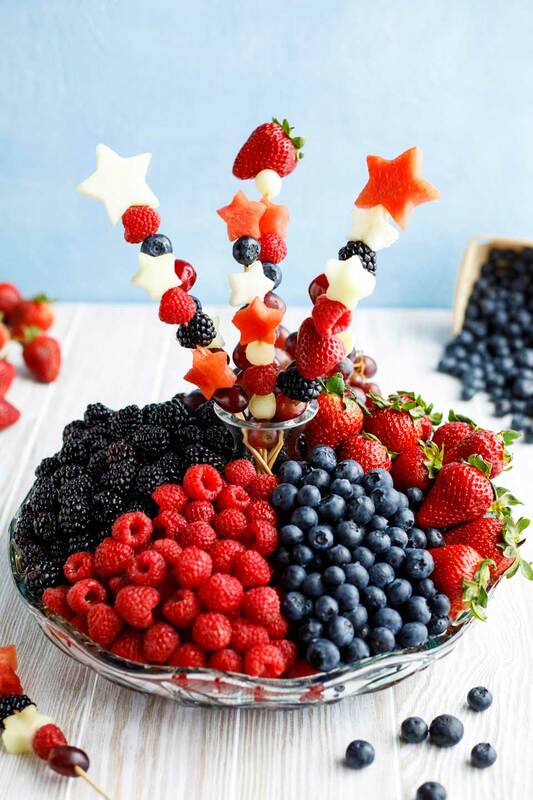 Thread alternating rows of red and white fruits (or angel food cake) onto skewers, leaving a rectangular area for blueberries and melon “stars” at the upper left of your fruit flag. 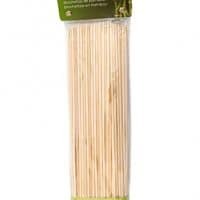 Then, you lay your skewers side-by-side, lining them up into a flag shape. 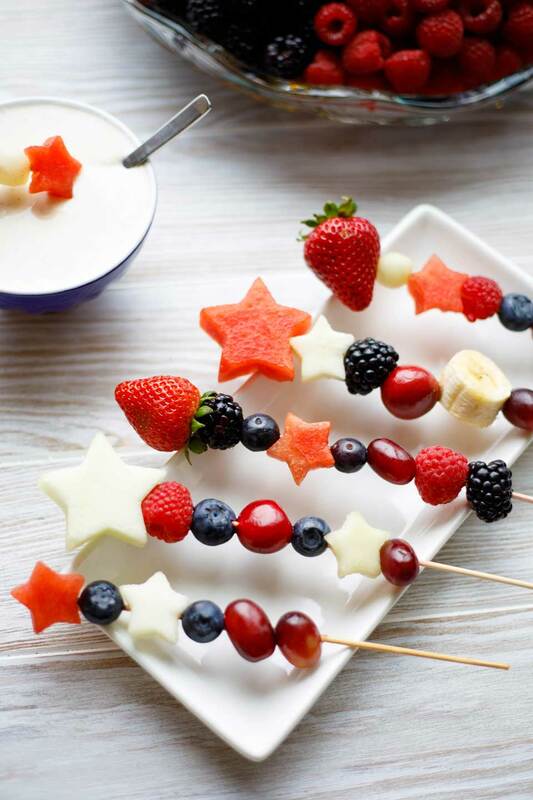 I’ve seen photos of this type of fruit kabob flag before (it’s definitely not an entirely new idea), but I didn’t see anybody making little stars for their field of blue. 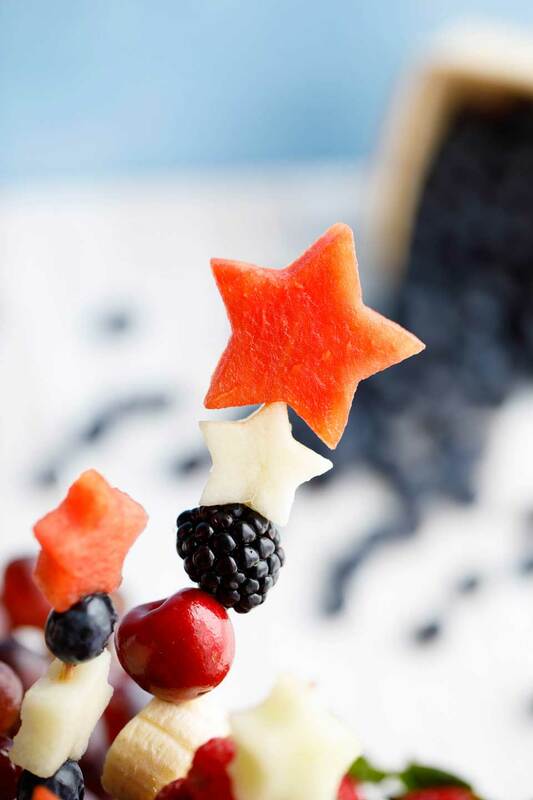 Most people just seem to thread blueberries on the skewers to make a blue box … without adding any little stars. Nothing wrong with going that route, but if you’ve got your star-shaped cookie cutters out, anyway … why not add some stars to your flag?!? Authenticity note: the American flag actually has red stripes at the top and bottom (not white like in my fruit flag). But, since I also wasn’t gonna worry about creating exactly 13 stripes, or 50 stars … I decided to maximize the dessert-y vibe in my flag, by starting and ending with cake instead. Totally up to you how you build your fruit flag … no worries … you’re playing with fruit here, so this isn’t really a rule-following situation! When it comes to choosing great fruit, go with whatever’s at its peak or looks freshest and most delicious at the market. Alrighty! I think you’re ready to have some patriotic, fruit-filled fun! Whether you’ve been tasked with bringing an appetizer to the picnic, or a dessert to the summer BBQ … either way, just show up with fruit on a stick, and let the fun begin! 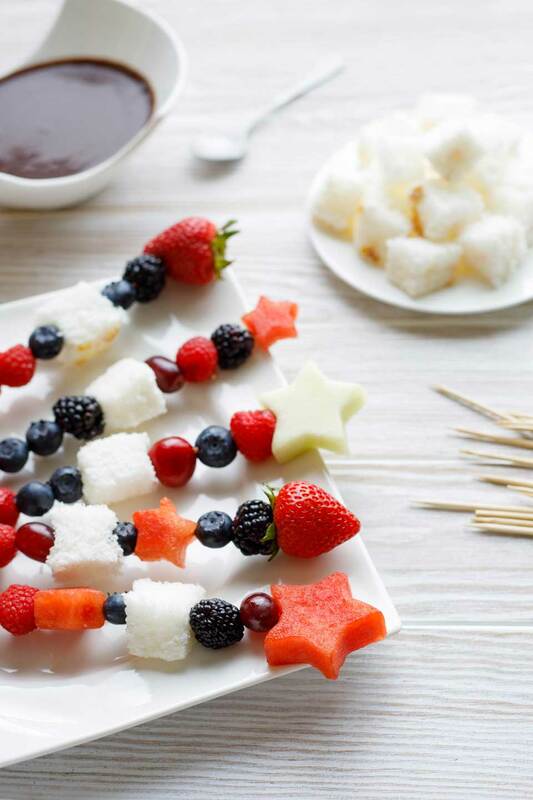 Red, White and Blue Fruit Kabobs are perfect for picnics and BBQ parties all summer long! They're surprisingly easy to make, and with our easy tips, you can spin them two ways: as an appetizer or a dessert! Wash and, if needed, peel or cut your fruit. 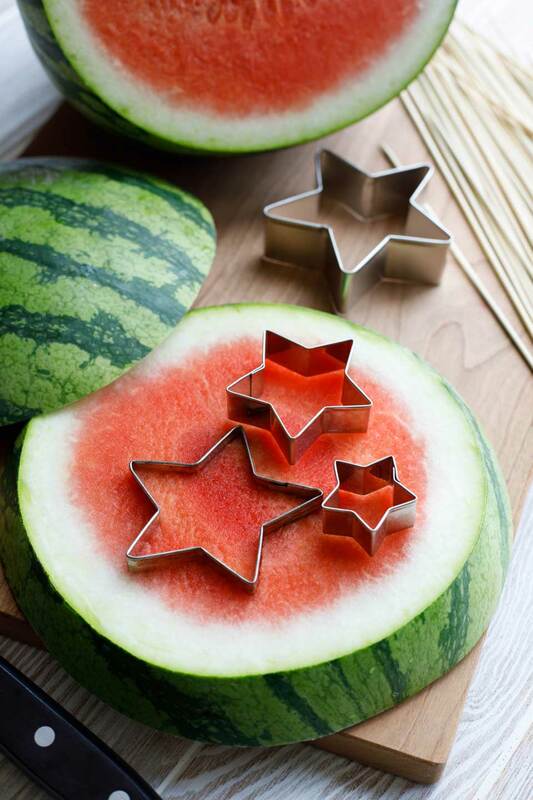 If desired, make some star-shaped cutouts by slicing melons slightly thinner than the depth of your star-shaped cookie cutters (generally about 1/2" thick is good), and using your star-shaped cutters to make stars of various sizes. Thread fruit onto bamboo skewers, alternating colors and types of fruit in pretty combinations. 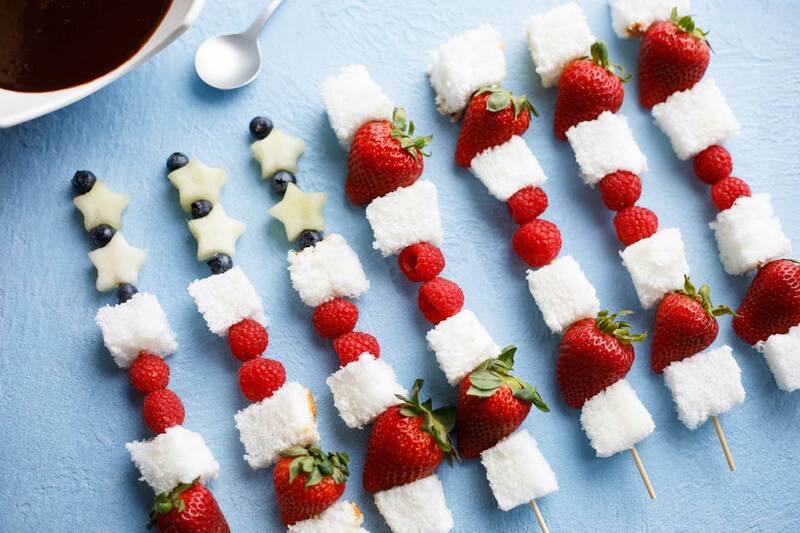 If making dessert kabobs, also thread cubes of angel food cake onto the skewers, in place of some of the white fruits. 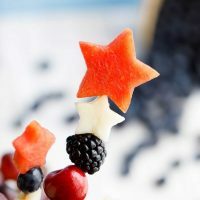 If desired, refer to the post for ideas and photos on how to present your fruit kabobs in an American flag shape or as a fruit bouquet. Serve with either the appetizer dip or the chocolate dessert dip (or both). 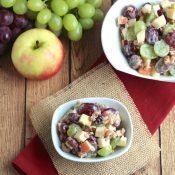 Make-ahead tips: Depending on which fruits you use, these fruit kabobs can generally be made at least a couple of hours in advance, and often even a day ahead. 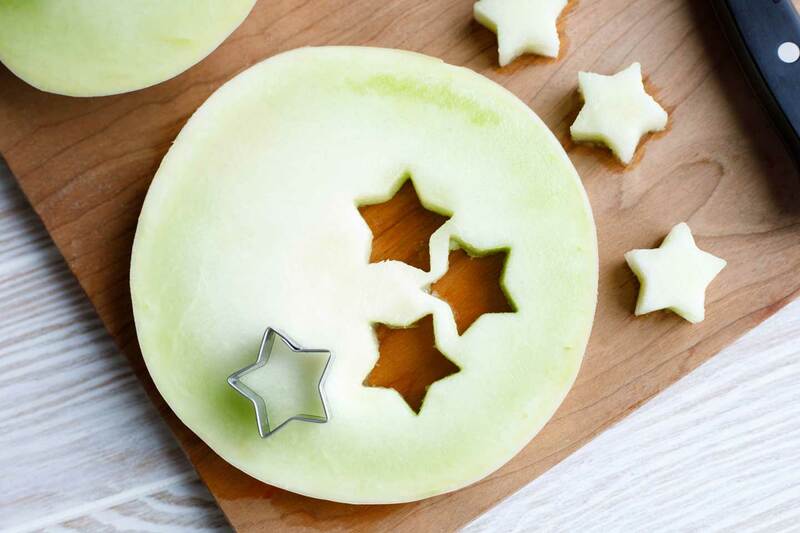 In addition, if you're cutting out melon stars, that step can also be completed a day or two in advance. Store your prepared fruit, covered, in the refrigerator until serving. Note, however, that bananas, in particular, do not hold up well and should be added only at the last minute. Also, if you're adding angel food cake to serve the fruit kabobs as a dessert, note that the angel food cake may become soggy if it's skewered ahead of time next to damp fruit, so it's often better to add the angel food cake closer to serving time (or offer it at the side if you'd like to complete your prep in advance). Both of our dips can be made a day or two ahead, as well. 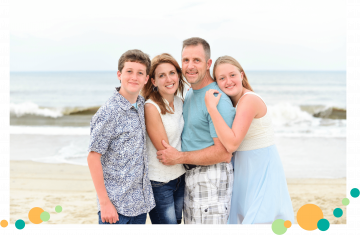 As an Amazon Associates affiliate program member, I earn from qualifying purchases.